For hundreds of years depictions have shown extensive creases on the tablecloths. This was achieved by ironing, placing in a napkin press and later, in the mangle. 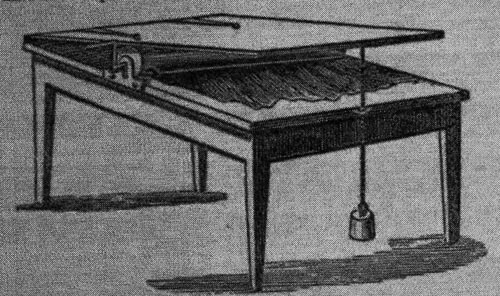 Several references show that the mangle was available in the early federal period, but more widespread in the 19th to the early 20th centuries. While Philadelphia was the capital, the Morris home became the President’s residence from November 1790 to March 1797. Washington had seen a “machine” at Ben Franklin’s home earlier, in 1787. Three years later, Washington wrote that he would keep the Morris mangle since it was “fixed in place” and they would take his. The ad is from 1799. "Visited a Machine at Doctr. Franklins for pressing, in place of Ironing, clothes from the wash. Which Machine from the facility with which it dispatches business is well calculated for Table cloths & such Articles as have not pleats & irregular foldings and would be very useful in all large families." "Mrs. Morris has a mangle (I think it is called) for ironing clothes, which, as it is fixed in the place where it is commonly used, she proposes to leave and take mine. 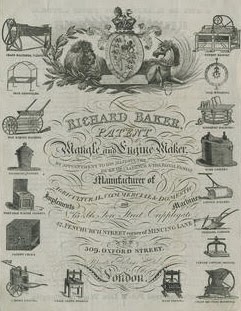 To this I have no objection, provided mine is equally good and convenient; but if I should obtain any advantages besides that of its being up and ready for use, I am not inclined to receive it..."
"Damp over the things, and iron or mangle them; the latter is used for heavy linen, such as sheets, towels, table cloths &c."
"The appearance of all table-linen is improved by being mangled in a machine, instead of ironing." Leslie, Eliza. Miss Leslie’s Lady’s House-Book. Philadelphia: 1863 19th ed. "Linen, cotton, and other fabrics, after being washed and dried, are made smooth and glossy by mangling and by ironing. 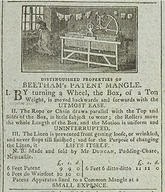 The mangling process, which is simply passing them between rollers subjected to a very considerable pressure, produced by weight, is confined to sheets, towels, table-linen, and similar articles, which are without folds or plaits. Ironing is necessary to smooth body-linen, and made-up articles of delicate texture or gathered into folds. The mangle is too well known to need description."